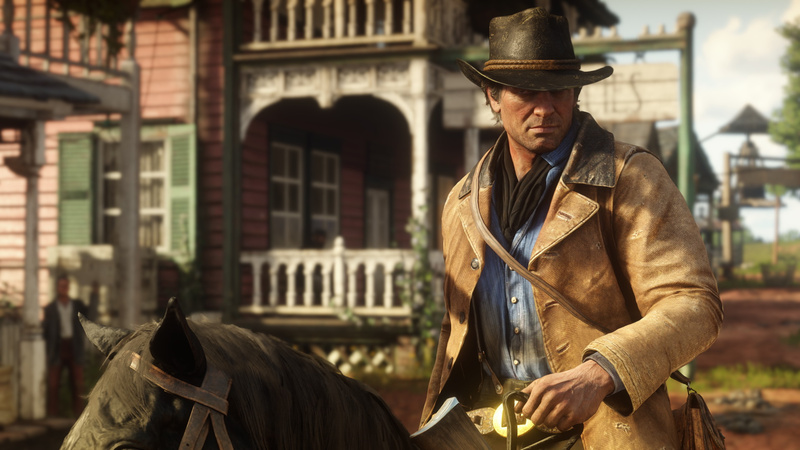 Rootin' tootin' open world western Red Dead Redemption 2 hasn't ever moved far from the top spot, but it makes a triumphant return to number one in the UK's latest physical chart. It swaps positions with the recent RPG Kingdom Hearts III, now in third place after debuting at the front of the pack. Another mainstay, FIFA 19, climbs back up two places into second, while Resident Evil 2 shuffles into fourth. The remainder of the top 10 is business as usual, really, with the likes of Call of Duty: Black Ops 4 and Spyro: Reignited Trilogy continuing to sell steadily. This month should bring a little more excitement to the charts, however, with Far Cry: New Dawn and Metro: Exodus launching in just a few days. RDR is boring. Dead boring and with controls ripped from Surgeon simulator. I just don't understand how it's so acclaimed and successful. Game of the generation! Can't wait to start my 2nd playthrough. I never saw a panther amongst a whole lot of other animals, I never saw this encounter at the General Store in Valentine but saw it on Youtube, some people never found the creepy siblings at Aberdeen Pigfarm, I did. This is what we're talking about! @themcnoisy it's not a game (its online mode is, though), it's a "Westworld" lite. Just be in it. You can't rush it. 1. it is the pinnacle of a "wild west" game and it's perfect the way it is. 2. it is a painful rehash of old ideas done poorly and clumsily. That's when I think about it objectively. Subjectively, though, I am happy to be in group 1. RDR2 is amazing. The weighty controls suit it perfectly. I can understand why it is so acclaimed and successful. Just to balance out @themcnoisy's point of view. @TheArt same here, Game of the Generation. I am on my 2nd play-through and already I am seeing things I never saw in my first one. EDIT: and I did NOT rush through my first game (played it and pretty much no other game from release date until 2nd Jan 2019). @QualityGeezer Yep, still stronger than most titles since 2013/14, graphically, gameplay and online. Just happy to see a predominately single player game top the charts, but man was RDR2 a chore to play. I think I would’ve loved it a lot more if you could’ve taken out 20-30 hours of filler, as the main narrative is incredible. RDR2 is nothing more than a poor man's Splatoon. @Neolit Same here, to think I played it thoroughly for 2 months exclusively till early January, and didn't see everything amazes me! And yea haha GTAV is on it's own planet right now. @themcnoisy i'm almost finished it and didn't find it boring at all, given that this is my first Rockstar game since the original GTA i loved every minute so far and don't want the credits rolling just yet so taking my time with it! I am one of the people who got tired of RDR2 fairly quickly, it looked amazing but its just not my type of game. Whilst I can appreciate its achievement, I If I have some game time I am more likely to reach for something like OutRun 2. I am really enjoying RE2 though. I still like first RDR more. @Fight_Sora_Fight same her. I nearly gave up at the final third as I was bored shi#less. Was glad to finally Finnish it and get shot of it. Glad I played and completed it but I won't ever get it again. @R1spam I know but there seems to be a disproportionate amount of this game in particular. It was more a reference to what I've seen a few people post about the likes of Spider-Man and God of War being traded in because they are linear as opposed to open world games which apparently are played forever. Ok who thought it would be good idea to release Far Cry New Dawn and Metro Exodus on the same day? @R1spam God of War is a short game with no online for anyone to keep their copy. GTA 5 has been out for many years now. @themcnoisy I'm a little baffled by it as well. I got RDR2 about a week ago. The characters and world are clearly excellent but I find the actual gameplay massively unsatisfying. I constantly feel like I'm fighting against the controller. I really don't like how it plays at all and I'm disappointed because otherwise the game looks really good. @carlos82 Hehehe I think there is a great game buried underneath the short 7hr average-dlc-length campaign of RE2, and it's sure to get thrown off the charts in a few months and go on to win the most traded-in game of all time maybe. Read Dead at no.1 and GTA and no.10. I like that. Proof that people in the UK are so jealous that they never had the “wild west”, they want to vicariously live that time through a video game. @carlos82 Lol but that's like every game out there's Completionist category on HLTB. Example, Dishonored DotO is a DLC yet, it's Completionist category is at 12hrs whilst RE2 is 10hrs.